Having flat feet is a problem that many people struggle with on a daily basis. Being flatfooted indicates you lack an arch in your foot. For many the condition is a natural foot position because they never developed an arch as a child. However some adults develop flat feet and this is called adult acquired flatfoot deformity. Patients without pain do not require treatment, but if pain is present it’s important to find the cause so that treatment can be provided. Congenital Alignment – Some people never develop an arch in their foot. Posterior Tibial Tendon Dysfunction – As a result of inflexibility, injury or overuse, the posterior tibial tendon (which supports the arch of the foot) can become agitated and stretched to the point that it no longer works. This is called progressive flatfoot and it is the leading cause of adult acquired flatfoot deformity. Ligament Incompetence – An important foot ligament, called the spring ligament, can be injured or stretched and over time and this can cause flat feet. Tarsal Coalition – More adults than children are known for developing flat feet as a result of this issue. Tarsal coalition occurs when the bones in the foot fail to separate during development. Once the bones are fully developed (typically in adolescence), pain arises. 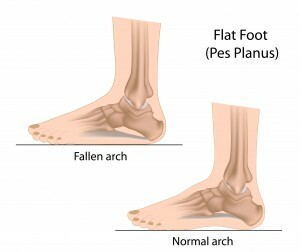 Other causes of flat feet and arch collapses include arthritis, injuries and diabetic complications. The majority of flat feet cases can be diagnosed with a physical examination and basic X-rays. Occasionally and MRI or CT scan is needed to assess the tendons and joints. Most patients are treated with non-operative treatments such as stretching, anti-inflammatories, braces, and physical therapy. Orthotics, which are custom-made inserts for shoes, are helpful with alleviating pain. Although these treatments can help with symptoms, they cannot cure the condition. Surgery is only reserved for patients that do not find relief with non-operative treatments. Surgical procedures vary and will depend on the cause of flat feet, but they may entail repairing the tendon, transferring another tendon to replace the damaged tendon, as well as fusion of the joints to improve foot alignment. Our Foot and Ankle Center offers some of the best orthopaedic surgeons and specialists that can pinpoint the cause of flat feet and provide treatment to alleviate symptoms. Call us at 904-825-0540 to make an appointment today.